If you're looking for a great (and cheap!) hotel in Munich, CheapTickets is the best place to find them. We offer deals on the best 457 hotels throughout Munich. No matter what you're looking for, we have options for you. Grab great rates on the 250 affordable 3-star hotels that are easy on the wallet without sacrificing comfort. Looking for more luxury? Try one of the 113, 4-star hotel accommodations in Munich. No matter your budget needs, we've pulled out all the stops to make sure you have plenty of vacation options. Maybe you prefer to search for your hotel deals based on what each hotel offers? For example, let's say you just want to find a hotel or resort that has a pool to cool off in after a long day exploring Munich. Scroll down to choose from the 37 hotels in Munich that has a pool for guests. Or search for deals on Munich hotels offering free wifi or breakfast, non-smoking rooms, and more! CheapTickets is here to be your personal travel agent for your next trip to Munich. Get booking today! What hotels in Munich offer free wifi access? Are there deals on Munich hotels offering free breakfast? Yes! The only thing better than finding a great deal on a cheap hotel in Munich is finding one that offers free breakfast. Grab some eggs, a waffle, or some healthy oatmeal before a day full of exploring Munich and all that it has to offer. Below are just some of the many hotels that offer free breakfast in Munich. 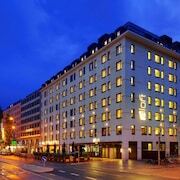 Hotel Italia is a 3.00 star rated hotel property in Munich that offers free breakfast. 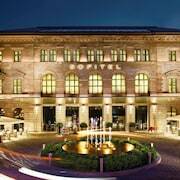 KING's HOTEL Center is a 3.50 star rated hotel property in Munich that offers free breakfast. 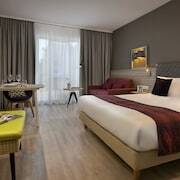 Derag Livinghotel am Viktualienmarkt is a 4.00 star rated hotel property in Munich that offers free breakfast. Holiday Inn Express Munich Airport is a 3.00 star rated hotel property in Munich that offers free breakfast. What about deals on pet-friendly hotels in Munich? Munich is a great place to get outside and explore with your pets in tow so don't leave your furry friends behind. Below you'll find great deals on hotels in Munich that allow pets. Don't forget to bring plenty of treats! Fleming's Hotel München-City is a popular, pet-friendly, 4.00 star hotel in Munich. Leonardo Hotel Munich City North is a popular, pet-friendly, 4.00 star hotel in Munich. 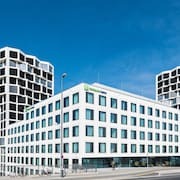 Holiday Inn Munich- Westpark is a popular, pet-friendly, 4.00 star hotel in Munich. 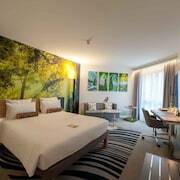 New Orly is a popular, pet-friendly, 4.00 star hotel in Munich. 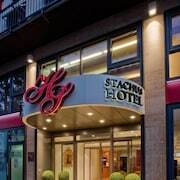 Any good rates on Munich hotels with restaurants? Absolutely. Don't want to deal with planning our all your meals on your trip to Munich? We don't blame you. Keep the hangry away by staying in one of the 185 hotels that have restaurants. With a room at one of these spots, all it takes to get a good meal is hopping in the elevator. Check out some of the most popular hotels in Munich that have restaurants below. Book Cortiina HotelCortiina Hotel is a 4.00 star hotel and has one or more restaurant options. 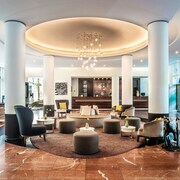 Book Leonardo Hotel Munich City OlympiaparkLeonardo Hotel Munich City Olympiapark is a 4.00 star hotel and has one or more restaurant options. Book Haus International HostelHaus International Hostel is a 2.00 star hotel and has one or more restaurant options. Book Mercure Muenchen City CenterMercure Muenchen City Center is a 4.00 star hotel and has one or more restaurant options. What are the cheapest hotels in Munich with pools? What's better after a long day exploring Munich then a relaxing dip in a pool? Finding the Munich hotel you need for a bargain! Cool off and unwind at one of our 37 Munich hotels with a pool. Browse some of the top deals on these hotels and resorts with pools in Munich below, but be warned: You may not want to check out! Hilton Munich Park has a pool and a 4.00 star rating. Hilton Munich Airport has a pool and a 4.50 star rating. Novotel München Airport has a pool and a 3.50 star rating. Holiday Inn Munich - City Centre has a pool and a 4.00 star rating. What hotels in Munich offer parking for guests? Once you've made your way to Munich, the last thing you want to deal with is finding parking close to your hotel. Avoid the hassle of parking around the block and carrying your luggage all the way to the lobby by booking one of our hotels with parking. Check out deals on some of the 324 hotels in Munich that offer parking for guests. Eurostars Book Hotel This hotel has a 4.00-star rating. relexa hotel München This hotel has a 3.50-star rating. Frederics München City Schwabing This hotel has a 3.50-star rating. Hotel Andra This hotel has a 3.50-star rating. Do Munich hotels offer 24-hour concierge services? When you're on vacation, things don't always go according to plan. Travel with peace of mind when you book one of our 81 hotels in Munich with 24-hour concierge service. That way you know help is always phone call or elevator ride away. Try Leonardo Royal Hotel Munich. It's a 4.50 star rated hotel in Munich that offers concierge services 24 hours a day. Try Residence Inn by Marriott Munich City East. It's a 4.00 star rated hotel in Munich that offers concierge services 24 hours a day. Try Platzl Hotel. It's a 4.50 star rated hotel in Munich that offers concierge services 24 hours a day. Try TRYP München City Center Hotel. It's a 4.00 star rated hotel in Munich that offers concierge services 24 hours a day. What about low rates on non-smoking hotels in Munich? Hotel Cristal München This hotel has a 4.00-star rating. Helvetia Hotel Munich City Center This hotel has a 3.00-star rating. BOLD Hotel München Zentrum This hotel has a 3.00-star rating. H+ Hotel München This hotel has a 3.50-star rating. What are the cheapest Munich 3-star hotel deals? Our 3-star hotels bring you quality accommodations at a lower price point for the perfect, budget-friendly vacation in Munich. With 250 3-star hotels throughout Munich to choose from, you still have options. Browse our selection below. KING's HOTEL CityStay. 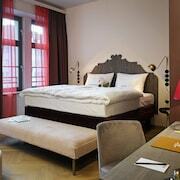 Located in Maxvorstadt, this hotel is within 1 mi (2 km) of Old Botanical Garden, Marienplatz, and Church of Our Lady. Old Pinakothek and Pinakothek der Moderne are also within 1 mi (2 km). Vi Vadi Hotel downtown munich. Located in Maxvorstadt, this hotel is within 1 mi (2 km) of Spaten Brewery, Marienplatz, and Church of Our Lady. Old Pinakothek and Pinakothek der Moderne are also within 1 mi (2 km). Buddy Hotel. Located in Altstadt-Lehel, this hotel is within a 10-minute walk of Karlsplatz - Stachus and Asamkirche. Marienplatz and Church of Our Lady are also within 15 minutes. Helvetia Hotel Munich City Center. Located in Ludwigsvorstadt, this hotel is within a 15-minute walk of Karlsplatz - Stachus, Asamkirche, and Church of Our Lady. Marienplatz and New Town Hall - Glockenspiel are also within 1 mi (2 km). What are the best deals on 4-Star Hotels in Munich? Munich is full of hotels and it can be hard to narrow down where you really want to stay. Luckily, we've done that hard work for you be narrowing you from 457 hotels throughout Munich, to the 113 4-star hotels in Munich. Our 4-star hotels in Munich are exactly what you need for your next family trip, romantic weekend, or solo getaway. Check out our most popular deals below. Eden Hotel Wolff: Popular with both business and leisure travelers for its convenient location, the rich in tradition Eden Hotel Wolff sits opposite the train station, close to Viktualienmarkt outdoor market. Guests can also visit Marienplatz or raise a glass at Hofbräuhaus beer hall; both are a 20-minute walk away in the Old Town. KING's HOTEL First Class: This seven storey hotel in the traditional style is located within 200 metres of the main train station, historic old town, and the vibrant Marienplatz. Platzl Hotel: Located in Altstadt-Lehel, this luxury hotel is within a 5-minute walk of Hofbrauhaus, Marienplatz, and New Town Hall - Glockenspiel. Viktualienmarkt and Residenz are also within 10 minutes. Residence Inn by Marriott Munich City East: Located in Au-Haidhausen, this aparthotel is within 2 mi (3 km) of Prinzregententheater, English Garden, and Deutsches Museum. Bavarian National Museum and Hofbrauhaus are also within 2 mi (3 km). What are the best activities to do in Munich? Skip-the-Line: SEA LIFE Munich Aquarium: Starting at just $22 per person. Residenz Serenade Concert: Starting at just $35 per person. Residenz Serenade with Bavarian or Gourmet Dinner: Starting at just $93 per person. City Center Segway Tour: Starting at just $85 per person. The staff was friendly, The breakfast was fabulous and I also had dinner at the restaurant 2 nights. The location is beyond perfect with how close it is to the train station and if you take a bus from the airport. The only thing that wasn’t good was that there was construction being done next-door and if you have a room facing the construction be ready for the workers to start by 7 AM… Actually one morning they did start at 5:30… Not a fault of the hotel but if you’re a light sleeper or want to sleep then try to get a room facing the inside. Great staff and hotel. The hotel is partially renovated as of our stay. Our room was large and one of the newer rooms. Small fridge and coffee maker. Location is very good. Metro is right outside and goes downtown and to Marienplatz. The are small bakeries and a small grocery 3 min walk away. There are also a handful of restaurants within walking distance. The hotel has an onside steak restaurant and a nice small bar with late night food options. The area fells safe and we enjoyed our stay here. The staff was always friendly and helpful. Nice hotel, great location! Close to the Christmas Market, train station, restaurants, Glockenspiel. Excellent hotel. Very comfortable room, friendly and helpful staff. Breakfast is fairly expensive, but worth it, in my opinion. The Breakfast Buffet is a feast with an extremely wide range of delicious foods, ranging from deer (hirsch) sausage and ham, to smoked salmon, many fresh breads, eggs, meats, etc. Very convenient to the Munich Hbh, which makes it easy to get anyplace via ubahn & sbahn. I had a small but very well planned single room which worked out better than I expected.